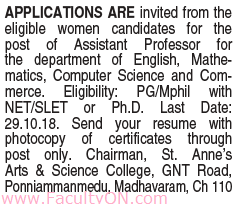 St. Anne's College of Arts and Science, Chennai has advertised in THE HINDU Classified newspaper for recruitment of Assistant Professor jobs vacancies. Interested and eligible job aspirants are requested to apply on or before 29th October 2018. Check out further more details below. About College: It was founded by a lay woman namely Thatipathri Gnanamma. She was a courageous and committed woman who hailed from Phirangipuram, a simple yet significant village in Guntur District, Andhra Pradesh, South India. She was given in marriage to Innaiah, the catechist of Phirangipuram. This pious couple was blessed with five sons. Unfortunately she became widow at the early age of 37 years. How to Apply: Interested and eligible candidates are requested to send their CV along with copies of certificates, testimonials and recent Passport Size photograph to the postal address mentioned below.